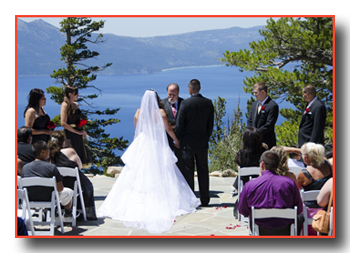 One of the greatest aerial views available of legendary Lake Tahoe in addition to being the most perfect spot for a Tahoe wedding is atop the renowned Heavenly Mountain on the Blue Sky Terrace. Situated at a height of over 9,000 feet, the terrace presents unimaginable scenic beauty that stretches beyond the horizon. 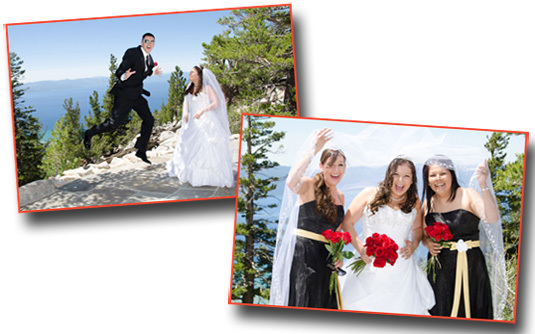 The glittering 72 mile circumferential shoreline of Lake Tahoe with the surrounding Sierra Nevada Mountain Range can be viewed as you make the climb to your wedding destination upon the resort’s gondola car. The gondola base where you board the swift moving cabin is located in Heavenly Village near the state line where California edges Nevada in South Lake Tahoe. Once comfortably seated in the six passenger gondola cabin, the upward ascent that scales along the mountainside is about a 15 minute ride that travels over 2 miles. Arriving to your destination at the midway point, you’ll exit the gondola and cross over the observation deck that reveals additional endless sights of wonder. Just beyond the deck lies the terrace where the aisle of matrimony awaits your presence. As you approach the Blue Sky Terrace, the ambiance of its serenity becomes apparent, and the surrealistic vision is impressive. Some of the amenities included with our terrace package are appetizers and beverages, a small dressing area for the bride, chairs for your guests, cocktail tables with decorative linen, a water station, gondola tickets for all attending that allows for passage to the event, and, of course, a spectacular backdrop of panoramic brilliance. Optionally, you may supply floral or other decorative items if preferred. 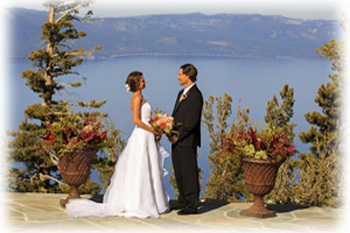 Weddings on the Heavenly Mountain terrace are seasonal and occur only during the summertime. The magnificent verandah is comparatively spacious and can accommodate up to 150 people. Suitable attire ranges from formal to casual. 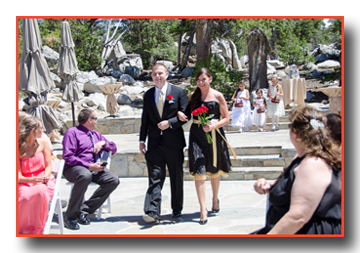 Since there is only one wedding conducted per day on the terrace, early reservations are recommended. Please note that the price quoted is based on the minimum number of 50 persons. However, although fewer guests may attend, the price remains unchanged.